Bye, my Beautiful Buffy. She passed away quickly and unexpectedly today. I don’t know who is going to miss her more, Angel and Xander the Gander, or all of us. all gone. It’s so quick! Not enough time. But I’m so glad to have known her. 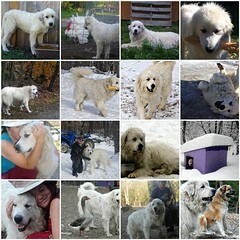 She was a great LGD who we got from National Great Pyrenees Rescue as a young puppy. Of all our three female Pyrs, Buffy was the low dog on the totem pole for her whole life, including all our so much smaller Icies, but she loved everyone she knew. Typical LGD — stayed up and barked much of the night, slept and was quiet most of the day. A mush ball cuddle bucket. She often rolled over so you could pet her tummy — gotta pay the toll or you can’t pass. She loved to chase the UPS truck down the fence line. She wasn’t bird safe when we got her, and ended up just absolutely bonded to her birds, turkeys, geese, ducks and chickens. I never thought she’d be okay with geese, because the goslings used to torment her and steal her food, and I was so worried she would kill them. But eventually they became buddies, and she just adored the goslings when they came. One of that first set adopted her then. Xander the Gander and she were besties. He loved her so much, and she’d often groom him too. She was so afraid of the chainsaw, that she’d head for hiding as soon as she saw Frank gassing it up. She was afraid of the Icie puppies! She never learned to play with them, really. She’d stand there and tremble and shake. So scary! After we lost Maggie, she was so alone and sad that we very quickly got her Angel, an Anatolian Shepherd puppy. She adored him, played so sweetly, taught him the ropes. They were such good buddies for about 18 months. I’m so sad I’m not there, and didn’t get to say goodbye. She was well loved and will be well missed.